I'd be happy to contribute, but you must understand that i'm a physicist with an interest in geology, not a practicing geologist. I do have a degree in geology from the U of Washington along with geophysics courses there. Also, i worked in the Texas oil patch as a geologist and at the Bureau of Mines as a geophysicist. This is not the same as an experienced field geologist. The pictures you (Flash) posted are obviously some sort of deposit of rock fragments in a finer matrix. I would guess they are volcanic breccia, possibly lahar deposits (volcanic mud flow) or surge deposits such as deposits due to the collapse of an unstable slope. I am thinking about starting an "Ask a Geologist" thread where folks can post a picture and the resident geologists can take a stab at explaining what it is or what might be going on. Would you be interested in participating as time permits and/or you feel so inclined? Take this for example. It is the lowest most of the pinnacles on the Pinnacles Trail accessible via short social trail at the end of one of the switchbacks. But is it really one of the pinnacles? 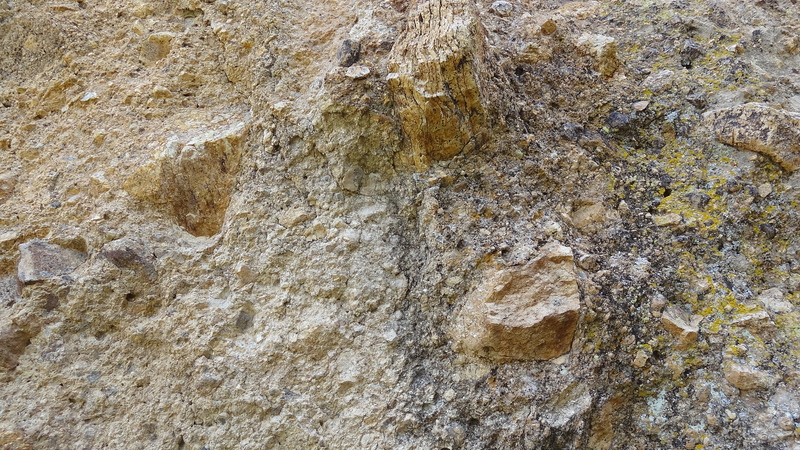 To me it seems an entirely different sort of rock, if not sedimentary, them metamorphic? Assuming it were sedimentary, based on the size of those clasts, would I call it a cobble breccia? But is igneous, are those gigantic mineral crystals such as orthoclase? Please forgive this petroleum engineer, if I have butchered my long dormant nomenclature. Sorry if took me a while to read this thread.... As someone whose fieldwork experience is with geology somewhat similar to igneous terranes (in my case, meteorite impact structures), I'd say you're mostly correct. It would be more accurate to say that we're looking at a debris flow rather than a surge (debris surges tend to be stratified, like layered rocks). In his recent USGS geologic map of the Chisos Mountains (Scientific Investigations Map 3140, which one can buy at many of the BBNP bookstores), Robert Bohannon identifies this as part of the South Rim Formation (which makes up most of the High Chisos), and notes that at the base of what he calls the "Boot Spring member" is something he identifies as the "outflow facies", essentially volcanic breccia 10 to 20 meters thick, which is what seems to be depicted in the photographs. As you suppose, most likely this is material that slumped off the side of the Pine Canyon caldera and flowed to the southwest as the caldera collapsed. For those interested i've added a trip to Dominguez Mountain to study the dike swarm there. Also went by the Dog Canyon area, adding an revising some material on that and Devil's Den. These are great posts Doc! Keep them coming. Are formations like the Black Peaks and Wasp Spring comprised in such a way that they are more resistant to erosion than other formations? If so, why? Or does it wildly vary? I like to climb in Big Bend and it would be informative to know what types of formations lend themselves to being harder and more solid rock. Lance, the Black Peak Formation is largely mudstone and therefore forms slopes, not cliffs. I have not seen any outcrop that i knew was Black Peak that was climbable, if you are talking about technical climbing. 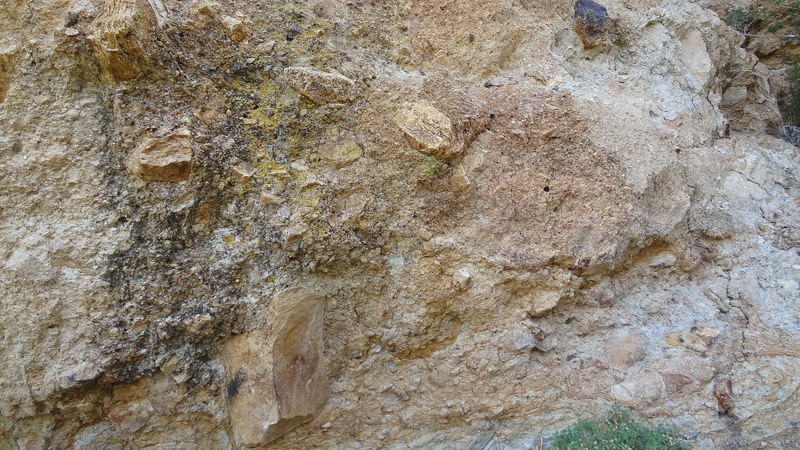 The Wasp Spring member of the Burro Mesa Formation is volcanic and well-consolidated (hard) where i've seen it. You would obviously need to confer with park personnel for any technical climbing. For example, i doubt you would be given a permit to climb the Wasp Spring cliff at Burro Mesa Pouroff! Another factor is the Wasp Spring is in between other rock layers that may or may not be climbable but part of the same cliff. 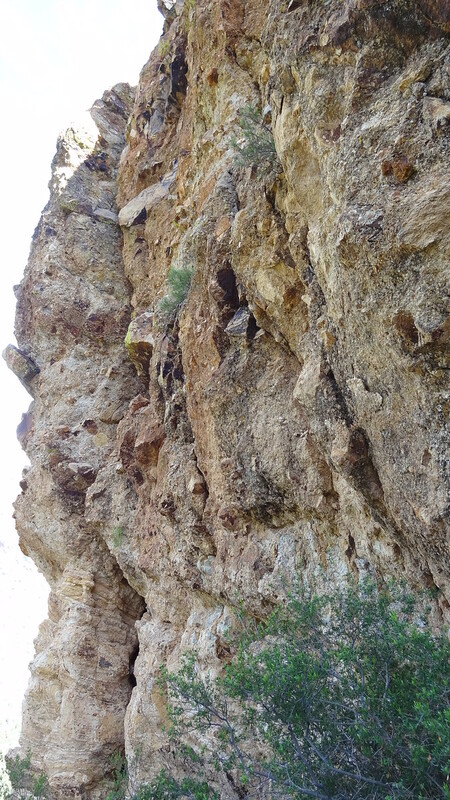 Its maximum thickness, which i think is along Blue Creek to the west of the high Chisos, is about 350 feet. See the Elena Canyon trip on my website: http://prism-redfern.org/bbvirtualtrip/elena/elena.html. The best theory, which i support, is that as the land arose and the Rio Grande came into being, the Rio Grande cut down into the rock forming the canyons. As i wrote there, "One may ask how it is possible for a river to cut such a deep (1500 feet) and narrow (down to 25 feet at one location) canyon. First, the river must become entrenched in its bed. This could possibly happen with rapid erosion in otherwise resistant rock. Limestone in an arid climate would seem to be ideal for entrenchment due to the fact it is soluble in water. This might mean the wet limestone bed of the river would be cut into rapidly (relatively speaking) while the dry banks would maintain themselves. Limestone in the river bed would be attacked by a combination of dissolution by chemical means and abrasion by sand and gravel carried by the swift currents. Once this process got going, a canyon like Santa Elena could be formed in one or two million years. It would only take an average erosion rate of about half a millimeter or less per year to do it." I'm not sure why there doesn't appear to be a "post" option, but only a "reply" option. Anyway, I'm adding some material to my website http://prism-redfern.org/. I've added a trip to Cow Heaven Mountain. I have also been to the east side of Talley Mountain and to the Mariscal mine. I did some research on that mine. Really interesting stuff. I hope to add these to my website in the near future. I've been interested in climate change since i was a grad student at SMU in 1968. One thing not mentioned in this video was the close correlation between carbon dioxide in the atmosphere and global temperature. The albedo effect mentioned is not considered to be enough to initiate ice ages. Somehow there must be a feedback to decrease CO2. The video did briefly refer to colder water being able to absorb more CO2, but i haven't heard any scientist claim this is the feedback important in initiating a new glacial advance. I think the biological changes in the ocean are more important, but the actual mechanisms of the feedback are not well understood. However, the paleoclimate record is clear. Temperature and CO2 rise and fall in tandem. The scary thing is that there is no geological record where the CO2 was rising as fast as it has been in recent decades. We are in uncharted territory. I've been digging into the climate long before it become good politics. No doubt... a 40% change in CO2 levels (roughly) is a big deal. We need to stop crapping in our nest (so to speak). What I liked about the video was the lack of apparent bias. He covered the "reasons for change" pretty well and, at the end, brought in the reality of CO2. We know it's rising at an alarming rate and we aren't quite sure what that's going to cause. He didn't try to sell us wind turbines, which are an abomination on the earth imho. Anything that rotates requires maintenance. The more energy in the rotating system, the more maintenance is required. But that's a whole nuther topic... One last thing- I much prefer solar power to wind. If they'll stop wasting money on rotating equipment and spend it on photovoltaic cell and battery research we will all be better off. One of the things that I've noticed, in my lifetime, is that the seasons have shifted. Winter comes later or maybe it's shorter, idk. It doesn't get cold when it did when I was a kid and spring doesn't get here at the same time. It's also gotten warmer overall, ie winters aren't as cold and summers aren't as mild (until this year). When I was a kid (60's) we saw Robin's (birds) in large flocks come down every fall and winter. They don't do that anymore and haven't in some time. I thought DDT (another subject for another time) or something similar had killed them off. Nope. I worked in Pennsylvania and Ohio 5 and 10 years ago, during the winter, and they are still around. They just shifted their migration northward. They don't come to the Texas Gulf Coast anymore. Not in the masses that they used to. The PBS Space Time YouTube channel will make your eyeballs contra-rotate sometimes. We live in interesting times. That was a good video as far as it went. Hard to be comprehensive in a few minutes. My calculations indicate that wind power, solar power, etc, will not be sufficient for a decent standard of living for the population that is supposed to be present on earth in the future. We have the technology to produce all the power we need. It's called feeder reactors. The problem is nuclear proliferation due to the fact these reactors produce plutonium. There is hope that designs can be achieved where the plutonium does not have to be removed from the reactor to possibly be diverted to weapons. Fusion power is a distant hope. Plus, feeder reactors produce radioactive waste that is a lot easier to handle than reactors on line now. It is so ironic that there is a clear way out of our energy problem that is negated by hate. It's kind of hard to believe that "they" can find the Higgs Boson and detect gravity waves but not come up with a clean energy source. Solar energy is abundant but the way we collect it and store is very inefficient. Wind is a great way for GE to make money. The elephant in the room is petrochemicals and the energy it takes to make them. iCe, with respect, not trying to be combative, but it is not appropriate to correlate the migration patterns of robins with a northward shift. In the south including the Gulf Coast, winter range is highly variable from year to year. The major driver for Robin migration is the availability of preferred food supplies. Most robins are short-distance migrants, but some do not migrate at all. Robins have exploded in population in the past 40 years, probably due to the change in land use that favors their feeding habitat. In winter Robins feed mostly on fruits and in summer mostly on invertebrates (worms!) They follow the food. I concede that changing climate affects the availability of food sources at different locations in N America, but the presence or abscense of Robins must be confirmed by good data. Ditto... but... From the age of about 8 to my teen years we lived in the same place. I now live about 20 miles north of there. The Robin's would arrive in late fall by the thousands, maybe 10's of thousands but I hesitate to claim that. Sometimes we remember things a little more grand than they really were. They were like large swarms and would take a long time to pass of they didn't stop. If I didn't ride around the back roads with a 600mm f4 lens hanging out of my window every fall I might not have given it any thought. They don't show up here anymore. "Here" is an area that's around 38,000 square miles according to Google Earth. I spend my time wandering around central to western Louisiana, east Texas, to San Antonio, down to Corpus, and back up the Gulf Coast. If I include travel for work (cameras are always on board) the area would probably double now that I have to run down to Venice and Bell Chasse fairly often. I don't know "why" they don't show up here anymore. I just know that they don't and haven't in a very long time. Bluejays are also conspicuously absent. They used to be everywhere. Again, I don't know why, I just know they aren't here because I travel the area quite a bit (work and play). As an aside, when I had an office down in Fal (Falfurrias) there was an aerial photo of about a section of orange or grapefruit trees just west of the plant. Like most pieces of land down there, it's covered in Mesquite and Huisache now. The photo is black and white and dates from around the 60's. Either way, point taken about migration patterns. There may be no correlation to the change in weather patterns over the last 40 - 50 years. Or maybe that tiny little piece of my time was actually a weather anomaly and what we have now is normal?